What is the maintenance cost of water purifier? (RO, UV & UF). Answered. What is the maintenance cost of water purifier? If you are looking for the answer for this question then I must say you are at the right place. If make until the end of this article you will know what is the actual maintenance cost of a water purifier is. So keep reading. If you are planning to buy a new water purifier then you may be concerned about the maintenance cost of the water purifier. 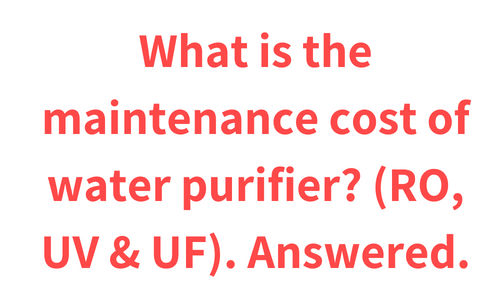 Actually the maintenance cost of each water purifier varies and there is not an exact answer for the question. The maintenance cost of the water purifier depends upon many factors like the purification Technology and the various filters used in the water purifier. Also the cost of the water purifier varies Brand-to-Brand. But here I am going to share some of the information related to the maintenance of the water purifier which will help you to get an estimated idea about the cost of any water purifier. The maintenance cost any water purifier is directly related to the filters of the water purifier. While maintaining a water purifier you basically have to change the filter of the water purifier periodically. So basically the cost of the filter of a water purifier determine the cost of the maintenance of the water purifier. 0.1 Now let’s talk about the filters used in and UF water purifier. 1 Now let’s talk about maintenance cost of UV water purifier. 1.3 Now let’s talk about UV purification. 4 Tips for reducing the maintenance cost of water purifiers. 4.1 1. Only use branded water purifiers. 4.4 4. Contact the customer support as soon as any issue occur. 4.6 6. Pay attention to the filters. 4.7 7. Service your water purifier only from Professional technician. Now let’s talk about the filters used in and UF water purifier. UF water purification is a very basic water purification Technology. UF water purifier does not have expensive water purification filters. Usually UF water purifier comes with an activated carbon filter and sediment filter. And you have to change them annually. And they are usually very cheap so the maintenance of the UF water purifier is very low. Average maintenance cost of UF water purifier is 500-1000 rupees. Now let’s talk about maintenance cost of UV water purifier. UV water purifiers comes with a UV bulb. And it is the main component of UV purification. As far as the maintenance of and UV water purifier is concerned you have to change the UV bulb annually or whenever it gets ineffective. The UV bulb does not cost much so the maintenance of and UV water purifier can be considered as a very low. Average maintenance cost of UV water purifier is 200-500 rupees. RO water purifier have the highest maintenance cost in comparison to UF and UV water purifier. The maintenance cost of RO water purifier is high because it is consist of many filters and also it has a RO membrane which is the heart of a RO water purifiers and RO membranes are very costly. You will have to change the RO membrane periodically or if it get damaged. Some water purifiers like Kent Water Purifiers comes with spin welded RO membrane which are damage proof. RO membrane usually gets damage due to visible or physical impurities like sand, mud, dust etc. But most of the RO water purifier also comes with UF water purification which basically removes visible or physical impurities from the water before RO purification. UF purification basically works as an protector for RO membrane in RO water purifiers. Besides some water purifiers also comes with various filters like Pureit water purifier comes with germkill kit which you will have to change periodically. The filters of the germkill kit usually are similar to that of UF water purification filters. Average maintenance cost of RO water purifier is 1000-6000 rupees. So these are the main 3 water purification technologies in the water purifiers. Most of the water purifiers are the combination of these three water purification Technologies for example RO + UV, UV + UF, RO + UV + UF. Now let’s talk about the maintenance cost of Such water purifiers. As mentioned above RO water purifier are consist of RO membranes. You will have to change the RO membrane of RO water purifier periodically as per mentioned in the user manual of water purifier or you will have to change a RO membrane whenever it gets damaged. The price of RO membrane is very high that’s why the maintenance of water purifier having RO water purification is very high. Also RO water purifier comes with UF water purification Technology and UF water purification is consist of activated carbon filter sediment filter. You will have to change the activated carbon filter and sediment filter periodically because it will get dirty due to mud and dirt. The price of such filters is very low (500-1000 rupees approximately). Now let’s talk about UV purification. The most important component of UV purification is UV bulb and you will have to change the UV bulb periodically or whenever it gets ineffective. The cost of the UV bulb is not very high (200-500 rupees approximately). So overall the maintenance cost of water purifier having RO + UV water purification is considered as high because of the RO membrane which you will have to change periodically. Average maintenance cost of RO+UV water purifier is 1000-6000 rupees. The maintenance cost of water purifier having UV and UF water purification technologies combined is low comparing to water purifier having RO water purification. You will just have to change the UV bulb and activated carbon filter and sediment filter which are the filters of UF purification periodically. The cost of UV bulb and sediment filter and activated carbon filter is low that’s why the overall maintenance cost of water purifiers having UV + UF water purification is considered as slow. Average maintenance cost of UV+UF water purifier is 1000-1500 rupees. The maintenance cost of water purifier having RO, UV and UF water purification is high only because of the RO membrane. Because our RO membrane are very costly and you will have to change them periodically whenever it gets damaged. Other than that you will have to change the UV bulb and sediment filter and activated carbon filter periodically which are very cheap. So overall the maintenance cost RO + UV + V of water purifier is high. Average maintenance cost of RO+UV+UF water purifier is 1000-6000 rupees. Tips for reducing the maintenance cost of water purifiers. 1. Only use branded water purifiers. Water purifiers of good brands comes with many benefits like they comes with annual maintenance contract AMC support. The benefit of AMC is that you just have to service your water purifier as per the schedule and if any kind of water leakage or any issue occurs even after you serviced the water purifier as per schedule then the company will take care of all the expenses which comes while fixing the issue. You must read the user manual of the water purifier carefully and in case you doesn’t understand anything then you should immediately call the customer care of the water purifier brand. Don’t hesitate to call the customer care and clear all your doubts as soon as possible. Also understand all the schedules of maintenance and service of the water purifier. When you buy a costly water purifier then it is also a good idea to invest in the water purifier cover which is very cheap. If you don’t found water purifier cover then you can just simply clean the water purifier with damp cloth periodically. 4. Contact the customer support as soon as any issue occur. Follow the servicing schedule strictly this will not only increase the life of pure water purifier but also you can get benefit of AMC if any issue occurred. 6. Pay attention to the filters. In case if you have RO water purifier then you must pay special attention to the all filters of the water purifier because if the activated carbon filter or sediment filter get useless and you do not change it then it can harm the RO membrane which are very costly. Change all the filters of pure water purifier as per schedule of user manual. This not only will increase the life of the water purifier but also it will help to maintain the good quality of the water. 7. Service your water purifier only from Professional technician. Always use genuine filter in the water purifier because if you use cheap filters in the water purifiers then it may cause a big issue in the future which may cost a lot of money to fix it. At the end we buy water purifier to drink pure and safe water so if we do not maintain the water purifier properly then it will not provide us pure and safe water so take care of your water purifier and it will take care of you. I hope now you know the maintenance cost of the water purifier and also how to decrease it. Let me know if you have any questions in the comments section below. I’ll try my best to answer them all.